Hi to all you crafty Australians. I have started a blog for Ag Art in Australia. Why not pop on over and check it out. Only in the beginning stages but would love some feedback, new members and of course would love to have some Ag Arters on board as well. Check it out at www.agartaustralia.blogspot.com . Hope that I can get sponsors on board to actually run an online competition in the future. Hi Craftsters, Been a long while since I was here but thought I would share my latest crafting effort with you. 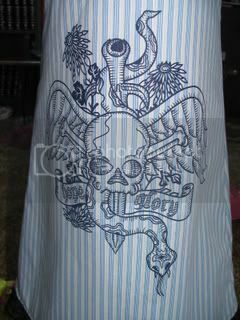 I entered the following garment into the Elmore Ag Art competition that was held at the start of this month. Some clarification on that last sentance may be needed. Elmore is a country town in Victoria Australia. Ag Art, is a wearable art garment made from items found around or produced on the farm. There are quite a few Ag Art shows held at different agricultural shows in Victoria, NSW and SA. All the winners from these smallers shows gather at Elmore for the Australian Nationals on the afternoon of the last day of the show. My garment Renewal, shows the ending of the ten year drought that has stricken our area, with the rain coming from the clouds (headpiece) and filling the rivers, and water flowing over the dry drought affected earth and turning it green, flowers regrowing etc. It is constructed from shade cloth, milk filters, tails paint and blue hayband. There must be over 1000 seperate pieces on the train alone. It took me approx 5 weeks to complete. There are three different sections to show in, under 21, Designer and Avante Gaurde. Renewal was entered into the Designer section of the Elmore Show, and won - WOW. It then went on to compete in the national show in the afternoon against several other garments and won there as well - Double WOW - so now I am over to New Zealand in June next year to compete against top designers over there. I had no expectations of being a major winner as this was the first time I had entered and there where so many wonderful/beautiful garments on show. I am sooooooo pleased with how this turned out, as soon as this challenge was announced I knew exactly what I was going to do. An explanation on the name - Jeannie Little is an Australian comedic icon - and she is well known for her ability to turn "strange" items into clothing. Garbage bags being among her favourites. I was unable to find pics of her fantastic plastic creations, but they where good. The skirt is made from the white bin liners and flows and rustles beautifully, tho the wind catches them so easily. The corset is made from the dishclothes and the green bin liners with a cachous diamonte brooch in the middle. The train is connected to the skirt and is made from the green bin liners. The veil is white bin liners, the roses are made from the melted offcuts from the skirt and worked out perfectly, the veil is embellished with the cachous. And just for fun a bunch of bin liner blooms, for the bride to carry. We had so much fun taking these pics, tho not a windy day, the slightest breeze had the skirt and veil all over the place. At one point I had to assist my model from the suffocating veil that had wrapped itself around her entire face. We had chooks chasing her, she must have sounded like the scrap bag, and same went for the horses. The local Agriculture show is coming up in a few weeks and I am going to also enter this in the craft section. I am so pleased with the way this skirt has turned out. It is a personal swap with bkrenning and I do hope she loves it as much as I do. The final ruffle was a bit of a trial tho - 680 iinchs/16 metres of fabric to gather and sew - it took me a full 3/4's of an hour to overlock and hem that sucker. Anyways just had to show it off. Let me know what you think. Book week again and this year a friend asked that I sew a costume for her son. I give you Mr Fred Flintstone. This young chap loved the costume tho was not thrilled with just wearing jocks underneath. It is fairly cold today, about 15 degrees, and the ground is wet from rain. Poor bugger. Oh well he can change out of it after the parade. I also made a furry hair hat. Book Week is here again (we don't have Halloween) and the kids dress up as book characters for school. Last year my daughter went as an Ooompa Loompa and we wanted to top that so this year she went with a friend as Raggedy Anne and Andy. I am thrilled with how they turned out. The only fabric I had to buy was the red and white stripe for the stockings so a major stashbust as well. She starts high school next year so these will probably be the last costumes from me until the young man starts school (3 years) I really enjoy doing this kind of sewing. Excuse the no shoes bit, it's winter and it's muddy for once. They have black shoes to wear. 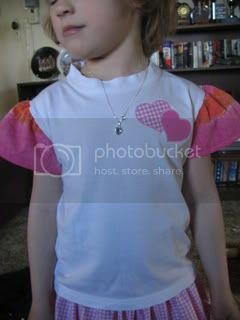 I have been so busy this week sewing for a girlfriends daughter who turns five today. 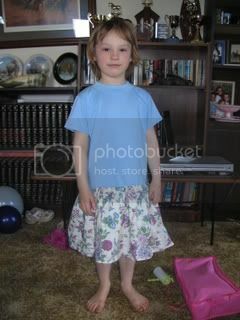 She has been my model for some of the clothing that I sell and has been pestering me for a skirt for weeks. 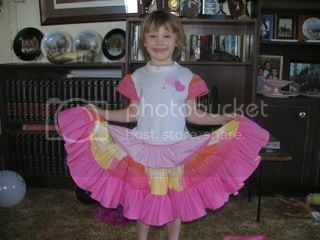 So here are pics of the outfits that I made for her. A rather plain looking outfit from the front, the skirt has tulle underneath and I wished it had turned out more tutuish, the fabric on the skirt is a fairy print. Tulle and fabric is gathered and sewn to the bottom of a plain t'shirt. A bit long I know and should have cropped the shirt a bit more. 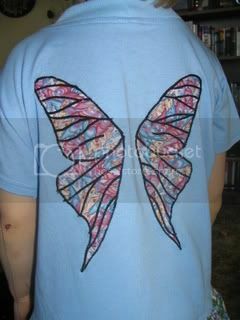 But the best bit of this outfit has got to be the appliqued wings on the back of the shirt. 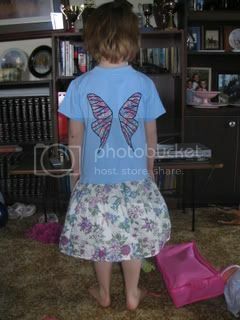 This fabric is a co-ordinating one with the skirt fabric and is fairy wings. 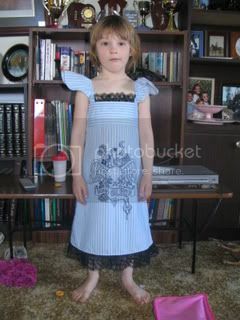 The second dress is from cheytowns tutorial for the shirt dress. I found this awesome shirt in the local op-shop for $2- and knew I had to give this dress a go. Lately I have been doing alot more knitting and crocheting, cause it's winter here in Australia at the moment. I have been using alot of patterns of the net which most come from American sites, and I am a little confused about yarn types. Over here I have only ever known yarn to be refered to by ply. 4, 8, and 12 ply. But patterns I have looked at on the net refer, fingerling, sportweight and worsted. Could some one please translate into PLY for me please. I have just purchased an Original Sizzix machine and I am wanting to purchase a hexagon die but I am having troubles locating one. I have checked the sizzix site online and Ellison, which had some hexagon dies but I was confused as to which if any of those might fit the sizzix machine. Can anybody out there offer some suggestions as to what brands are compatable with my machine or know where I may be able to get one.